IDF Navy Week Musings with IDF’s Maritime analysis. This post must begin on Navy Day which falls on 4th December with a statement of import, though the media has been less excited about Navy Week in its dissemination as its election time. This is the Era of MARITIMIZATION and Navies world over are being beefed up and India cannot afford to lag as Navies are capital intensive and need long term planning. Indian Navy tries it best but delays, cost overruns and casualmess by MOD have plagued its expansion but has cut its coat well with the cloth given to it, and flown India’s flag high in over two score International and Tri Service exercises and HADR. The year 2018 was a more or less accident free, unlike other Navies. So it deserves a BZ on Navy Day ! The Navy has done with just 14% of the Defence Budget 2018-19 at Rs 40,4195 crores from a total of Rs 295,511 crores ($42.7Bill), only 1.4% of India’s GDP. The Air Force got 22%, the Army 52%. India’s maritime security needs more teeth, and larger budget allocations in the coming years. Before Army and Air Force feathers get ruffled IDF must explain. Looking back the current five year NDA/BJP DISPENSATION India saw a shed of Non Alignment Era with Strategic Autonomy. PM Modi and India’s leadership have based its foreign policy a lot on Indian Navy’s prowess and ability and India’s military and geographic location in the Indian Ocean and on India’s intelligent but at times devious population which brings in religion as a guiding factor in politics and derails progress. It keeps Courts busy to the determent of other cases. Police reforms have been neglected and Police have become more political like many Institutions and think tanks. This should worry the Armed Forces to avoid a seep. In Indian Navy, religion has had no place and is respected as one’s personal choice. A Captain has to run his ship as a well oiled team… 24×7 to the last Topass and this is drummed into every ship’s company. The Navy boasts of this quality. Today media especially TV has made religion its TRP space and Navy must ensure harmony. The words Secular and Hindutva are intriguing for a serviceman as every serviceman is brethren ! Admittedly, India’s Navy is a capable maritime force to be able to announce it is predominant in the Indian Ocean Region (IOR) well over Pakistan as the Net Security Provider (NSP). This has been rightly stated by CNS Adm Sunil Lanba more than once to the media. Politicians get pleased with that. The challenge is larger and Doklam took the eye off the ball. The Navy has competent manpower as seen by their post retirement prospects, and state of the art ships with long range supersonic BrahMos and AA Barak-8 missiles and ASEA radars like M/F Star E/LM 2248 and communications with GSAT 7 and aircraft like P8I for MDA with attack from the sea with Mk 84 Harpoon and Mk 48 Torpedoes and powerful MiG-29Ks with KH-35 anti ship missiles and a lone aircraft carrier INS Vikramaditya’. 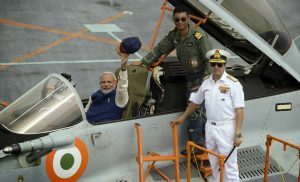 But for true success, commensurate with its size and ambitions to sit astride the world stage, and to deter an aggressive China and its higher than Himalayas and deeper than the Oceans friend Pakistan, which continues to vitiate the atmosphere and hinders India’s progress and keeps Army occupied, the Navy needs numbers in platforms as 35% remain in refit. CNS has conceded China is entering around 18 platforms every year into its Navy and Coast Guard. The Trump administration has been rattled by China’s actions in the South China Sea (SCS) and moves into IOR and changed the name of its largest theatre command, the Pacific Command (PACOM) to Indo Pacific Command (INDPACOM) to bring in India. USA, Japan, Australia and India have joined a Quadrilateral (QUAD) as a consultative grouping to face China’s moves into the South China Sea and Indian Ocean. India has ruled out a Military Alliance for the present. PM Modi went to the Shangri-La dialogue this year and spoke of India’s interests in the South China Sea and Navy exercises there regularly with USA and Japan and in SIMBEXES with Republic of Singapore Navy as recently as November. In Buenos Aires PM Abe for J President Trump for A , welcomed PM Modi’s JAI aimed at China in the Indo Pacific like an arrow. PM Modi met Presidents XI and Putin and held some two dozen meetings. This all enhances Navy’s responsibilities beyond the Malacca Straits. In 2018 the Navy has faced a drought. It did not commission any new warships but decommissioned three minesweepers and a missile frigate INS Ganga in two separate ceremonies on 22nd and 23rd March. ABG Shipyard Ltd at Surat had bagged an order for three 4000 ton training ships for Rs 480 crores each in 2011-12, declared bankruptcy. Alcock Ashdown Shipyard Ltd at Bhavnagar suspended construction of the remaining five 500 ton Australian design Catamaran survey ships after delivering the first INS Makar. The five Naval Offshore Vessels (OPVs) to Reliance Defence and Engineering Ltd (RDEL) at Pipavav has progressed at snail’s pace after launch of Shachi and Shruti in July 2017 by Mrs Preeti Luthra wife of Vadm Girish Luthra. CNS stated guarantees are being cashed. . Despite the depletion and aging of ships and submarines, India’s 65,000 strong Navy’s with 134 ships and 210 aircraft has lived up to its 2018 motto, ‘Combat Ready’ with a dozen major International and national exercises with a high tempo. The Navy’s home built Nuclear submarine INS Arihant joined India’s Triad targeting its 750 Km K-15 missiles from underwater on orders in very low frequency encrypted signal from New Delhi via Navy’s INS Kattoboman near Tirunelveli. Arihant after its nuclear patrol was received and complemented by Prime Minister Narendra Modi on 5th November at Vishakhapatnam. From 17thto 23rd November Navy’s Western Command Mumbai with HQ IDS executed a large scale tri-Service exercise off Karwar and Goa. It deployed a Kolkata Class BrahMos destroyer, Landing Ships and a Fleet tanker. Army troops participated in amphibious landings. Air Force’s C-17, C-130J, IL-76, and AN 32 aircraft of the IAF with naval aircraft including P8i took part with insertion of Special Forces from sea, and ‘Combat Free Falls’ by Tri Services Special Forces. The exercise culminated with joint ops on land and de-briefs, enhancing Inter Service operational synergy. During Navy Week celebrations CNS Adm Sunil Lanba took stock of the year gone by and announced plans for the future in a media conference to take Indian Navy to 200 ships and submarines and 400 aircraft by 2050. The year is ending with good news. 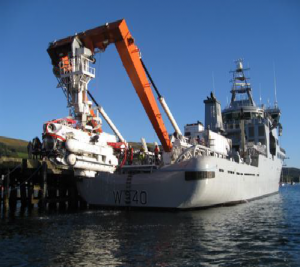 The Navy inducted the first of the two LR8 James Fisher Deep Submersible Rescue Vessels from UK by marrying it on a platform’s stern. The MOD cleared orders for survey needs, and awarded the Rs 2345 crore order for four 3300 ton 110 m long Survey Vessels fitted with latest Internetted survey equipment to Garden Reach Shipbuilders & Engineers Ltd (GRSE) Kolkata which had earlier suffered a crane collapse. On 10th November GRSE laid the keel for the first of three 6,400 ton Rs 6,600 Project for 17A BrahMos missile fitted frigates. Fincantieri of Italy will provide support for design optimization and modular construction; training and ongoing technical assistance. Looking ahead the (MOD) cleared the proposed acquisition of 16 shallow water anti-submarine vessels (ASW), to be shared by Cochin Shipyard Ltd(CSL) and GRSE in the ‘Buy and Make India’ initiative, for around Rs 10,000 crore. Navy knows its task. 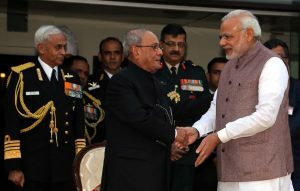 A big responsibility rests on the MOD and NSA who has taken over many decision making activities with his hold on Intelligence as an expert, and chairs the Chiefs as an Adviser though not a Constitutional Authority. CNS Adm Sunil Lanba stated all three Chiefs have recommended a permanent Chairman Chiefs of Staff and as the current Navy Chief has age to 65 he seems suited for the post and IDF may see it happening as Navy has seen in the past. . PM Modi takes decisions in a un predictable manner he is known for and the three Chiefs need a head. Shan Na Varuna.